This brief overview was taken from the current Reynolds High School Website. Our high school has a rich history that we were a part of for two years. Read to learn what all is going on now! RJR still proudly stands! 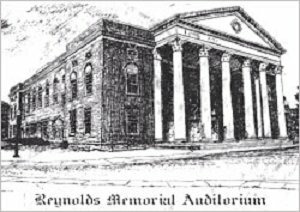 R.J. Reynolds High School is located in the heart of Forsyth County and has proudly served the community of Winston-Salem since its opening in 1923. The school fulfilled the need for a new city high school after fire destroyed Winston High School on Cherry Street. The site for the school was made possible through the generosity of Katherine Smith Reynolds Johnston. The original school building and auditorium have been extensively renovated and because of their architectural significance and continued contribution to public and cultural education, they are listed on the National Register of Historic Places. Students at Reynolds High School have a wide range of academic choices, providing a niche for every talent and interest. RJR administration strongly believes in the education of the whole child and encourages participation in extracurricular activities. Newsweek magazine listed R.J. Reynolds 211th out of America's 1,257 top public high schools. The magazine's ranking placed Reynolds 10th in North Carolina and first in Forsyth County. Reynolds students scored the highest average on their SAT scores (1,088) in the school's history, which also was the highest average in the county. Eight students were National Merit Scholarship semi-finalists, more than any other Forsyth County high school. Two students were awarded Morehead-Cain Scholarships to the Univeristy of North Carolina at Chapel Hill, the only two recipients among Forsyth County high schools. Reynolds was one of only three high schools with multiple winners. One student was awarded the Park Scholarship to attend N.C. State University, one of two WSFCS high schools with a student nominated. One student was awarded the Duke Scholarship to attend Duke University. Twenty-three students made Level IV on the N.C. Writing test, number one among WSFCS high schools. Eleven students earned perfect scores on the N.C. Writing test, more than all other WSFCS high schools combined. Seventy-four percent of the Class of 2007 was accepted at a four-year college or university. More than 40 percent of Reynolds faculty hold advanced degrees. Reynolds' student body contained students from 38 countries, speaking 26 languages, making it the most diverse high school in WSFCS. Reynolds offers 40 student clubs and organizations whose purpose is to address student interests and needs. Reynolds competes in the Central Piedmont 4A athletic conference and offers 37 athletic teams for its student-athletes. Reynolds won the 2010 and 2011 Mens Dual Team Tennis State Championship.